Click the chart to check yields on Treasuries and other bonds. NEW YORK (CNNMoney) -- The Federal Reserve's plan to push long-term interest rates lower is already working, with the yield on the benchmark 10-year Treasury note hitting a new record low early Thursday. A day after the central bank announced Operation Twist, a plan to shift $400 billion from short-term Treasuries into long-term bonds in an effort to boost lending, yields on long-dated government debt fell sharply. Thursday afternoon, the 10-year Treasury yield fell to a fresh all-time low of 1.695%, while the yield on the 30-year bond dropped to 2.790% -- its lowest since December 2008. 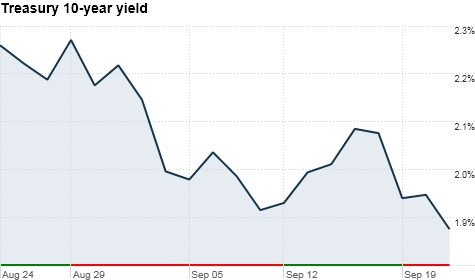 The 10-year yield had dropped as low as 1.858% on Wednesday, while the 30-year bond yielded 3.01%. The rush toward Treasuries comes as investors bail out of stocks around the world. While Operation Twist was exactly what investors had been anticipating, meeting expectations was just not enough. "These measures can't make the economy worse, but neither, we think, will they make things much better," said High Frequency Economics chief U.S. economist Ian Shepherdson in a note to clients. Yields have been on a steep decline for weeks now as mounting fears about Europe's escalating debt crisis and the slowing United States economy have pushed investors toward traditional safe haven assets, including Treasuries. Yields keep falling. How low can they go? The 10-year yield fell below 2% for the first time ever in mid-August and has been drifting around or below that level since. The Fed's latest forecast on the economy further frightened investors. In its statement Wednesday afternoon, the central bank warned that there are "significant downside risks" to their already gloomy economic outlook, including strains in global financial markets. "We have a global economy that's in trouble, and the Fed is making that crystal clear with the actions it's taking and the statement it has been making," said Bob Andres, Chief Investment Strategist at Merion Wealth Partners. As the fears and risk of a recession continue to rise, investors will likely continue to seek safety in U.S. Treasuries, which could send the 10-year yield as low as 1.5% over the next six months, said Andres.